Rudolph, Dasher, Dancer, Prancer, Vixen, Comet, Cupid, Donder, and Blitzen are the most commonly cited names of Santa’s nine reindeer. In the poem “The Night Before Christmas” (attributed to Clement C. Moore), from which the names of the reindeer come, the reindeer known today as Donner and Blitzen were originally Dunder and Blixem (the Dutch words “Donder” and “Bliksem” stand for “thunder” and “lightning”, as rendered in English orthography). Dunder was later reprinted as Donder, which developed into Donner (the German for “thunder”); while Blixem quickly became Blixen and then Blitzen (German for “lightning”).. All of these reindeer names are recited in the first verse of the popular song Rudolph the Red-Nosed Reindeer, which in turn has helped make Rudolph by far the best known and most popular with children. Rudolph the Red-Nosed Reindeer was born for the American department store chain Montgomery Ward in 1939, and has since entered the public consciousness as Santa’s ninth and lead reindeer. All of the above reindeer have been proven to exist throughout multiple theatrical appearances, although in the film The Polar Express only eight of the reindeer can be seen pulling Santa’s sleigh-. 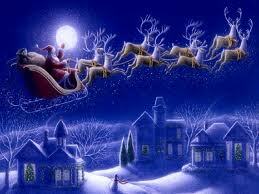 Dasher – The first reindeer and the right-hand leader of the sleigh before Rudolph was included. He is the speediest reindeer. * Dancer – The second reindeer and the left leader before Rudolph was included. She is the graceful reindeer. * Prancer – The third reindeer and on the right in the second row. She is the most powerful reindeer. * Vixen – The fourth reindeer and on the left-hand side in the second row. She is beautiful, and also powerful like her companion Prancer. * Comet – The fifth reindeer and on the right-hand side in the third row. 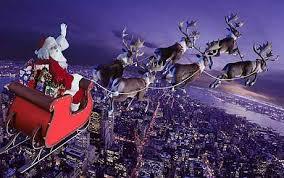 He brings wonder and happiness to children when Santa flies over everyone’s houses. * Cupid – The sixth reindeer and on the left-hand side in the third row. She brings love and joy to children when Santa flies over everyone’s houses. 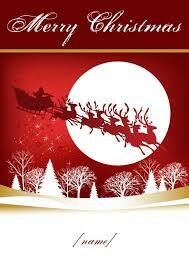 * Blitzen – The eighth reindeer and on the left-hand side in the fourth row. She is the “lightning” reindeer, but in American pop culture Blitzen is frequently portrayed as a male (for instance, in the animated Rudolph the Red-Nosed Reindeer Blitzen is the coach of the reindeer games).